MP Robert Goodwill said the new attraction is 'an opportunity not to be missed'. The new Flamingo Land Coast on the former Futurist site is an opportunity not to be missed according to our local MP. MP for Scarborough and Whitby Robert Goodwill said the first designs of the attraction, which were released earlier this week, came as no surprise to him as the rollercoaster ride, the viewing tower and the winter garden "are in line with what we've been expecting". He added: "This is an opportunity that can't be missed, it will be an amazing asset and another reason for people to come to Scarborough. I'm sure that Flamingo Land which attracts tens of thousands of visitors will be giving out vouchers to encourage people to come here so I'm 100% behind this project." 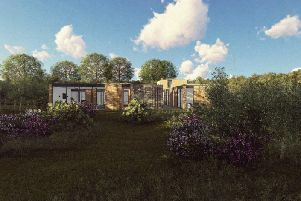 The first artist's impressions of the site attracted mixed reactions from members of the public, some of whom think the new development doesn't fit in with the surrounding Victorian buildings. However, according to Mr Goodwill, this shouldn't be a matter of concern. He said: "Just look at City Hall next to Tower Bridge, it works very well. As long as it's built to a very high standard I think the mixture of old buildings and new buildings can work really well. Another example is the London Eye right next to the Houses of Parliament where people queue all the time to get a panoramic view. With this new viewing platform people can have a similar experience here." Also questioned by the public is the location of the attraction, to which the Scarborough MP responded: "Should we build it out at Morrison's or at the park and ride, away from the town centre? No, it needs to be down at the seafront to drive people into town and encourage them to visit the other attractions that we have. "The thing is there will always be people against progress but if any seaside resort was offered an opportunity like this, they would grab it with both hands. Many traditional seaside towns are in decline, they're not able to attract families in the way we are. This is exactly the kind of investment that we need and it's going to benefit restaurants, shops... We must not miss this opportunity and what we don't want is that hole in the ground where the Futurist was to still be there in ten years time."